Israel is located at the eastern end of the Mediterranean Sea Despite its small size, it is home to many of the world’s most significant architectural structures and ancient geographical landmarks. In this 14-part series, you will learn details about Israel’s rich history and the meaning behind the sacred sites found within her gates. 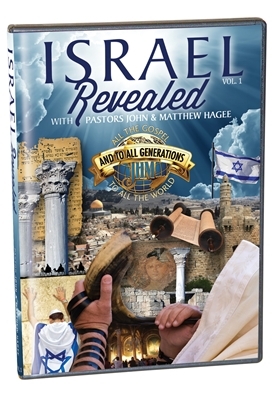 “Israel Revealed” allows you to experience the sermons of Pastors John and Matthew Hagee, taught as JHM toured through the Holy Land. This 14-part series includes three volumes including the following titles: Caesarea 2010, Masada 2010, Beatitudes 2010, Devotionals, Masada Concert, Odyssey parts 1 & 2, Footsteps parts 1 & 2, City of David/Garden Tomb Discoveries of Israel, Ein Kelt Beit Shean, Qumran, Petra, and Southern Steps. Copyright © 2013 Christians United for Israel. All Rights Reserved. Built with Volusion.